It is not that we believe what we see. It is that we see what we believe. If you believe that you are not worthy of goodness, are not allowed to have what you want , or that there is always not enough, those feelings will come out in your relationship with food. If you believe that you are not allowed to have joy, or that joy is for "other" people , then you find yourself restricting food or you find a way to make eating a painful experience by eating while standing up, driving , bingeing, reading, etc. Our relationship with food allows us-because we are "acting it out"- to see what our beliefs are. Most of us were given beliefs by around us. Even if nothing happened to us as a child, we still have perceived a set of instructions about who we are supposed to be, that are not exactly aligned with our deepest self, our truth. It is not that we believe what we see, It is that we see what we believe. Those beliefs that were given in early life show up in our relationship with food and only when we become aware of those beliefs, we create a space to question them not by judgement, but curiosity. Only through inquiry, we can access new beliefs, new world. Your new world becomes available on your plate. Your relationship with food on your plate present an opportunity to grow and transform. What if it is a doorway, not a wall, an opening , not a closing? What if it is a gift that allows you to unravel your true deep hungers? What if it is an invitation to create your own beliefs? What if all you have believed about life, yourself, abundance, change, possibility, change, joy comes out in HOW, WHEN, and WHATYOU EAT? 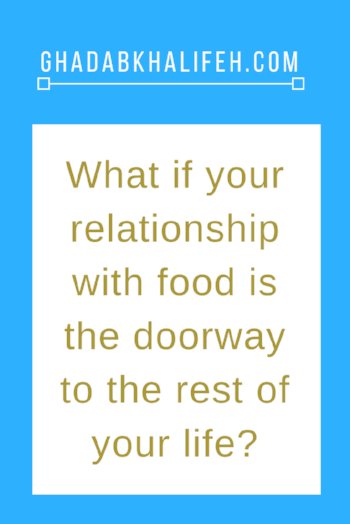 What if it is possible to drop the struggle with your relationship with food ? What can your relationship with food teach you ?